Windows Presentation Foundation (WPF) provides rich Ui compared to WindowsForms.These features of WPf can be used in the windows forms.We can embed the controls developed in WPF into Wnforms. This is achieved using the Elementhost. BBelow is the sample where a WPF Expander control is used in windows forms. 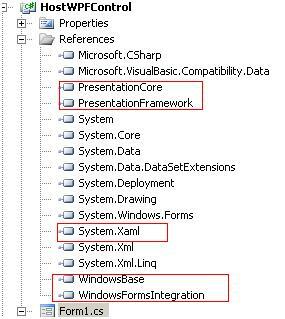 1.Create a WindowsForm project HostWPFControl. 3.Open the Form1.cs. file in designer. 4.Open the Form1.cs file, add the following reference. 5.Add the Form1_Load event, add the following code. 6.Now run the application.You will see the expander control, when expanded you see a datetimepicker.